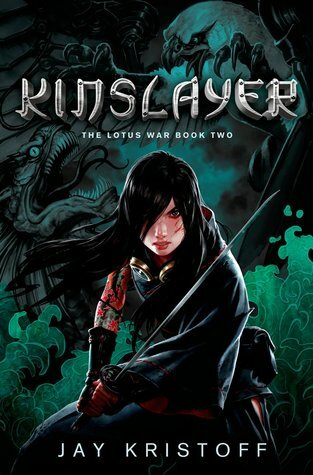 The lotus war comes to a climax as forces human, machine, feathered, and underworldly collide with devastating consequences, all with Shima’s fate hanging precariously in the balance. The Lotus War is at an end now that I’ve finally finished Endsinger. This book sat on my shelf for far too long. There are things I love about this series and some things that made me a little reluctant to read it. Let’s start with the good things. The worldbuilding was great with airships, chainsaw katana, griffons, lightning farms, the destructive blood lotus, a creation myth, demons…I could go on for a while. The plot was interesting, involving twists and turns I didn’t expect and the Lotus Guild’s true motives were quite sinister indeed. It’s written well, the characters are realistic with a dash of bravado and dark humor, and I loved Yukiko’s relationship with Buruu. All things Japanese and Steampunk were awesome. So if this story was so awesome, why did I always have a tendency to put off picking up the book, only to put it down again not long after? It comes down to one simple thing: loss. I couldn’t put my finger on it until I was about halfway through Endsinger. I was so distracted by the worldbuilding and action that it didn’t occur to me just how much these characters lose. I understand that when you’re in the middle of a bloody revolution that there is going to be some loss, but each character in this story loses so much. Some characters had already lost several people in their lives before the fighting even began. I think this series had the highest body count of everything I’ve read so far. The heaviness that all that loss created made me hesitate to read where I should have been completely absorbed. Don’t get me wrong, the whole series wasn’t horribly depressing. There were lots of wonderfully positive moments mixed in that had me smiling or cheering on the inside, but it wasn’t enough to completely balance it. 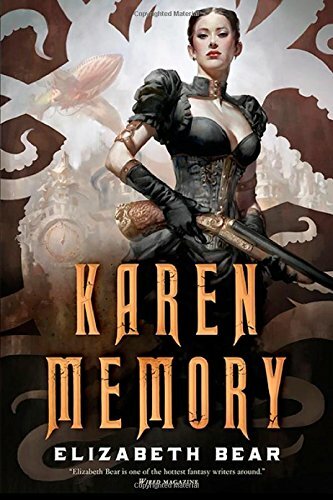 Karen Memory is a self-proclaimed “seamstress” who actually works in a brothel, in a steampunk version of America’s Pacific Northwest. When a girl is left murdered outside their door, Karen and her fellow “seamstresses” are pulled into a risky adventure just to survive. The first thing you’ll notice in this story, aside from Karen not being an actual seamstress, is the way in which the story is narrated from Karen’s perspective. It’s not her being the narrator, of course, but that the entire novel is written with her accent and level of education, which means it’s not always grammatically correct. Now it seems spot on, at least from all the historical dramas I’ve seen on TV, but it can take a little getting used to. This story was wonderfully inclusive when it came to race, gender, and sexuality, which I think is very appropriate these days, and more stories should be this fluid and nonchalant. Sure, given the historical context, there were obvious limitations to these people, but within their little community, all was completely accepted. I always love stories where a group of misfits, who don’t fit in the narrow limitations of what society condones, come together and form a kind of patchwork family. It seems that often times, the strongest bonds come from choice rather than blood. There was a fair amount of action, and a few awesome steampunk gadgets, although a lot of the steampunk aspects of the story took more of a backseat to the narrative. There was a little more subtlety when it came to the steampunk, at least for a large portion of the story. I guess you could say it was a more realistic kind of steampunk. I had been hoping for a little more swashbuckling girl power, given the image on the cover. In reality the story largely revolves around certain men that like hurting women, especially those of Karen’s profession, which started wearing on me. Steampunk novels generally involve some form of oppression, but when it is very specifically focused on hurting women, it starts to get a little too heavy for me. It makes it difficult for the world-building, gadgetry, and adventure to be enough to make it fun. Somehow, it’s just a little too close to reality. Sure, I read plenty of fantasy novels with their fair share of violence and war, but a lot of that violence is directed toward unearthly things, or spread out in such a way that there is enough of a break from it. This story had some wonderful aspects to it, but its focus on this particular topic took some of the fun out of it and made it feel longer than it was. Nate Tucker’s new apartment building is a little strange – padlocked doors, odd light fixtures, and mutant cockroaches… but the rent’s good. This book is not about zombies. Just thought I’d make that clear. So many apocalyptic novels involve one brand of zombie or another. It’s either some sort of zombie plague that makes people crazy or violent or one that turns them into vampire-like monsters that are, again, crazy and/or violent. Lots of people love that stuff, but I generally don’t, although there is the occasional exception. What is so wonderful about 14, is that this book’s brand of apocalypse is completely different, and involves a more classical approach to the end of the world. Unfortunately, saying anything more would give away the story, trust me, it’s cool. On the cover, this book is compared to the TV show LOST, but I disagree a little on that point. Yes, they both have mysteries, but I feel like the similarities end there. I didn’t really like LOST. It was good at first, but I gave up on it a few seasons in. Why? Because the mysteries kind of sucked. Well, actually, the mysteries, at first, were great, but they ruined them over time by, either ignoring them altogether or by having really anticlimactic reveals. 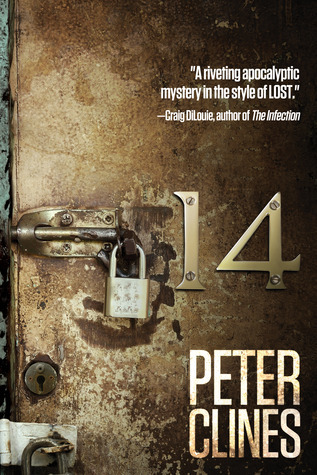 14 slowly builds intensity with its mysteries, each one more pivotal than the last. Pretty much everything of importance is answered and what is revealed is awesome. I didn’t see it coming. The characters are good and create a well-balanced atmosphere of silliness with occasional seriousness. The book has a slightly lighter feel to it in that regard, but it kept the adventure fun. It was serious when it needed to be, but there were also plenty of jokes and geek references too. [You know how everything on the other side is covered in sand? 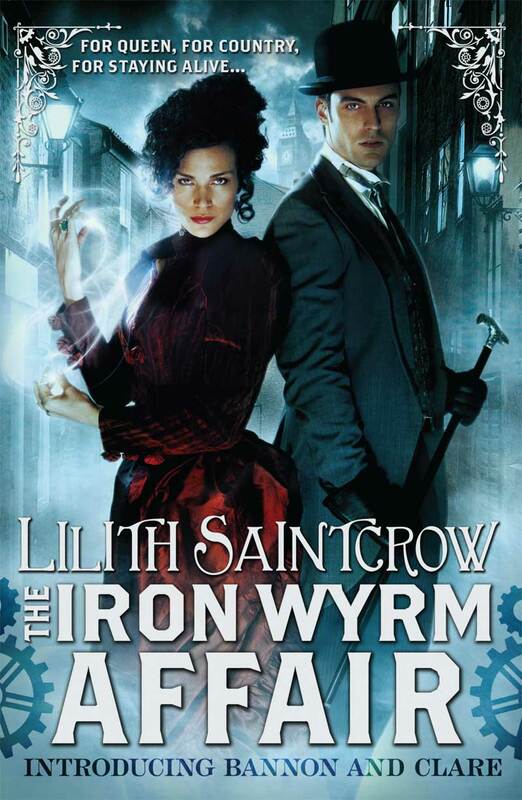 Sorceress Emma Bannon and mentath Archibald Clare team up for the first time to thwart various nefarious plots against Londoninium, an alternate history Victorian London. If it’s got a steampunk cover I’m going to read it, no matter what. Nothing will stop me, not even the writing style in this book. From what I’ve gathered, some steampunk authors like to honor their Victorian time periods by adopting a more Victorianesque writing style. This can make a fun 300 page mystery/adventure into a more labor intensive read. I almost gave up 80 pages in, but I hate giving up on a book, so I persevered. “Emma climbed to her feet, brushing off her dress.” The only problem here is that there was never any mention of her not being on her feet to begin with. As far as I knew she had been standing the entire time. Other such inconsistencies had me a little lost at times. All this vagueness and confusion is a real problem when you have a book with some serious world building in it. A lot of the peculiarities of Londoninium are thrown at you at a fast pace, which would be a challenge with the clearest of writing. It’s a lot to take in and with the writing on top of it, this book took a lot more effort to read than I would have liked. The back of the book claimed that Bannon and Clare are forced to work together but can barely tolerate each other, but they actually tolerated each other quite well. They are certainly opposites, but I detected no real animosity between them, not even slight annoyance. There was far more conflict between Bannon and her Shield (who is a person by the way). Misleading book covers aside, it was a decent story with some pretty cool world building. It’s steampunk sorcery with a touch of Sherlock Holmes. Mentaths represent the logical, while sorcerers represent the illogical. Clare was every bit the image of Holmes, and Bannon thoroughly represented the unladylike Victorian lady, that classic female character in a historical time who breaks social convention habitually, but still cares if her dress is ruined. The two were a little cliche, but it didn’t really bother me. 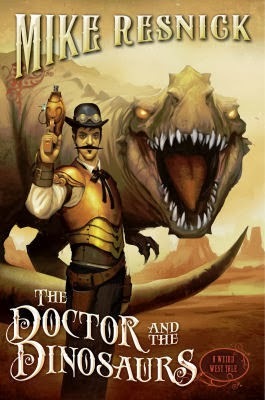 Doc Holliday, Theodore Roosevelt, and some friends defend themselves from the dinosaurs the Comanche have resurrected in an effort to remove a couple of overly enthusiastic paleontologists from digging in their sacred burial grounds. What was so surprising about this novel is how much I learned about history and the history of paleontology from reading it. I was expecting a fun dime novel style adventure, which it was, but it was also filled with real life historical figures. I never thought Doc Holliday and Theodore Roosevelt could be so interesting and I never knew about the bone wars between Cope and Marsh. Their rivalry was so intense, you would think it would have to be fiction, but these things really happened. It was clear the author did his research. I don’t read westerns. My only experience of the genre are movies like Cowboys and Aliens and the Lone Ranger remake, but put a bit of steampunk on the cover and I’ll read anything. The story was fun, moved quickly enough, and was filled with surprisingly interesting historical characters. It had an alternate history vibe, but in the way where you feel like it could have actually happened that way without the history books finding out. You would think that reading fiction is purely about entertainment and imagination, but there are some books out there that entertain but also teach without you even knowing it. I was curious from the beginning about which characters were really real, and there was a handy appendix in the back of the book with quick biographies of the real life historical characters. Sometimes the truth is more interesting than fiction. Jay Kristoff is quickly becoming my favorite author. When I read Stormdancer, I was most impressed by the world building, but now that I’m quite familiar with Shima, the blood lotus, and the Guild, I had time to notice the writing. What I find so wonderful about it is how effective it is in painting a picture. There is not a wasted metaphor in sight. Imagery and metaphor flow and blend in such a casual way that you don’t notice it by itself, it just makes the scene that much more vivid. The author also utilizes short sentences to create a sense of force and urgency and he does it in just the right places. I’m a fan of short and to-the-point sentences mixed in with fancier writing. It keeps the writing from getting out of hand and distracting from the story. As for the story, things get more complex. Good and evil is not as black and white as it was in the first book. Some of the Kage are blinded by hatred and vengeance, rather than being the noble revolutionaries they were at first glance. Saving the world from itself is messy. Things are a lot harder on Yukiko this time around and she has to dig deep to figure out exactly what she’s doing and why she’s doing it. You can’t just start a revolution and fly off on your thunder tiger and be a hero. The character complexity was really good here. People make choices I wouldn’t have expected, but after thinking about what they’ve been through, it makes sense in the end. I want characters to behave unpredictably so I can think about why later. It’s not just the time reading the words on the page, but the time in-between reading, thinking about what I have read, that I enjoy so much. I won’t give much away here but…GAIJIN! Yes, we finally catch a glimpse of the round-eyed barbarians and their own brand of steampunk technology, which is pretty awesome.